Hello! 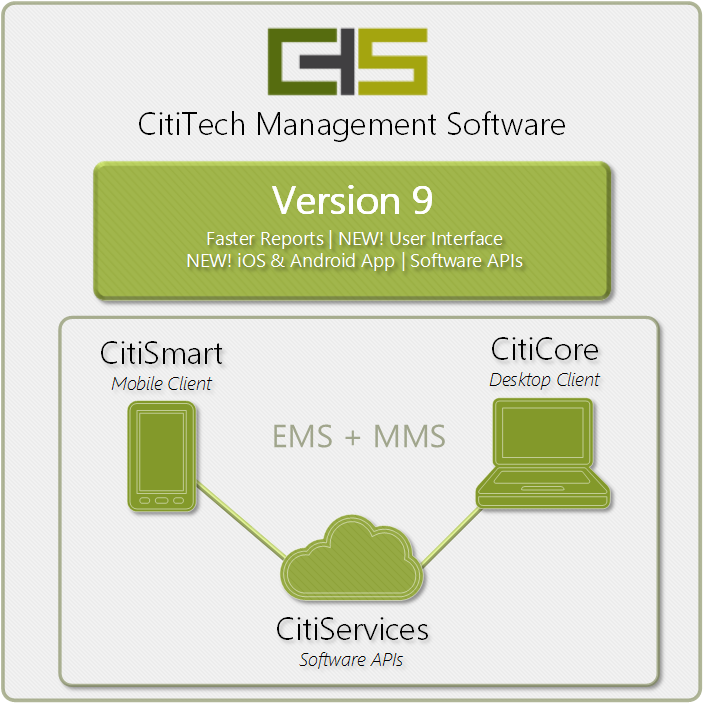 All of us here at CitiTech Systems are working diligently on the next awesome evolution of our software, Version 9, due for release…. Approximately 400 Mississippi Department of Transportation staff …. For many years Dynamic Segmentation has been ESRI’s module …. Meet our newest developers! We are lucky to have two smart, talented developers join the CitiTech team, just in time to …. Hello! All of us here at CitiTech Systems are working diligently on the next awesome evolution of our software, Version 9, due for release later this year. Read on to learn more about how we’re upgrading CMS functionality to keep up with new trends, and taking it to the next level with the help of amazing new additions to our developer staff, our partner (Microsoft), cool new features and technologies, and you – our users. Enjoy the newsletter, and keep the suggestions and feedback coming. We’ll listen. Approximately 400 Mississippi Department of Transportation staff attended the 2015 MDOT Maintenance Management Conference May 12-14 in Jackson, MS where they discussed maintenance issues and got a sneak peak at new Version 9 software being developed by CitiTech Systems. Brian McKiernan, CitiTech president, and Cassidy Keyser, CitiTech’s senior software engineer, outlined CMS’s move from a desktop application to a web-based services oriented solution. The shift will greatly enhance CMS’s ability to deliver real-time data to desktop computers, laptops, tablets and smart devices using Android or iOS operating systems. CitiTech unveiled a new set of web apps that will streamline how data flows from the office to the field. The new Dispatcher, a web app that notifies users of pending work orders, will send either emails or text messages to Smart Phones and other devices alerting them of new and existing work orders. Field workers can then log into the Internet, view the work order, add comments, resource usage and work accomplishments, complete the work order and automatically complete the work report without having to enter data in disconnected mode or tracking work on paper. “This new enhancement demonstrates CitiTech’s commitment to new technology tools that are expanding information flow between devices,” said McKiernan. New web apps are being developed for work orders, work scheduling, work reporting and asset creation/viewing. Over time, these new applications will augment CMS’s integrated work and asset management system and leverage the Internet using the latest techniques available. CitiTech is also developing a series of Web APIs that expose CMS data for external uses. These tools can be used to develop new data entry forms, reports and data extracts by user IT personnel. Version 9 will also see a marked improvement in performance, especially with large data sets. Because CMS can store gigabytes of data, large complex reports could take a significant amount of time to gather and present data. Using new stored procedures that use powerful servers to process the request and a new technique that delivers only the results of a query has shown a performance improvement that surpasses SSRS report benchmarks. Despite its move toward the Internet, CMS will retain its ability to operate disconnect from a network, including an Internet network. Using HTML5 tools and caching, users will continue to be able to work in areas where no wireless or data networks exist and upload data when a network becomes available. “We are committed to delivering state-of-the-art tools to our users,” Keyser said, “and are focused on improving the user experience. User screens are being re-designed to be more intuitive, logical and simple-to-use. Our new Version 9 software will be a collaborative effort between CitiTech and our diverse user base.” MDOT and ALDOT, the Alabama Department of Transportation, have both expressed interest in serving as beta test sites to offer input, suggestions and other possible enhancements. Version 9 is scheduled for release by fourth quarter 2015. What does it take to create a whole new version of software? Smart ideas include involving current users, improving existing functionality and performance, and adding new dimensions to CMS’ capabilities. That sounds like Version 9 to us! We began by surveying our users – what are your priorities; what’s important to you? We reviewed “Requests for Enhancement” Tickets – how would you, our users, like to see CMS improved or enhanced? We reviewed RFPs – what do our future customers want in their software? We researched exciting new technologies – how can we leverage them to improve functionality, performance, and speed? We explored options with our partner, Microsoft – what is available, and what are some distributable options? We looked at other software programs – what are their great features, and how can we incorporate them into ours? We held meetings and discussed what our new software would do and how we could do it. In some cases, we went back to our users to discuss feasibility. We talked about what we had to add, what we had to change, and what we could leverage to make it happen. We even voted on how it would look. Now we’re making that vision happen! Version 9 is on the horizon – as you’ll see in “Cool Stuff“, below. Our goal for Version 9: to provide you with easy to use, knock-your-socks-off software and fast reporting. Your job: tell us how we did. Luckily, several users have volunteered to be first; they’ll tell us what they love, what they don’t love, and what’s missing – and help us improve CMS for everyone. Thanks, beta testers! Our new version will have all the great features you’ve come to expect – only better, and faster. Some modules have expanded accessibility, some have expanded functionality, some have improved performance, and some, like Component Control, will be new to Version 9! Watch for our announcement of release in coming months. A new user! We’re thrilled to welcome Rankin County, MS, to our CMS family. Rankin County is the fourth-largest county and one of the fastest-growing counties in Mississippi. An urban/rural county, it is a suburb of Jackson, MS, the state capitol, and home to several government officials. It has over 900 miles of roads, plus bridges, and helps maintain roads in several communities. 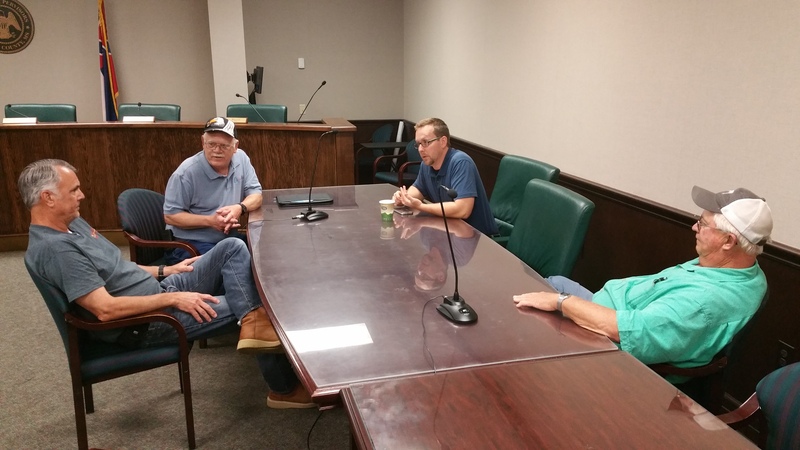 Dale Westbrooks, the road manager, receives thousands of work requests per year and needed a system that would track the work order and the costs associated with doing the work order. But, he wanted a solution that did more than just track work orders. He wanted something that would help him track where he did work and what it cost, and evaluate efficiency and effectiveness. The objective was to provide the best possible service at the lowest cost and improve the level of service to the county. Rankin County used a Mississippi Department of Transportation contract to purchase CMS at a very favorable license cost and plans on using the software to better track work requests and the actual cost of doing the work, as well as tracking those costs to individual assets. Rankin County is the sixth Mississippi county to implement CMS software – joining Warren, Lee, Tunica, Harrison and Oktibbeha counties. For many years Dynamic Segmentation has been ESRI’s module to help manage data (data entry, search, mapping) on linear features without going through a process of splitting and merging. It was – and still is – heavily used in transportation/utility related industries. ESRI has evolved. The new extension – ESRI Roads and Highways – is a linear referencing system solution that allows for multiple linear referencing methods – and it can handle the temporal aspect of the data. It is gaining momentum in implementations at large organizations like state Departments of Transportation and others involved in transportation planning and road maintenance. 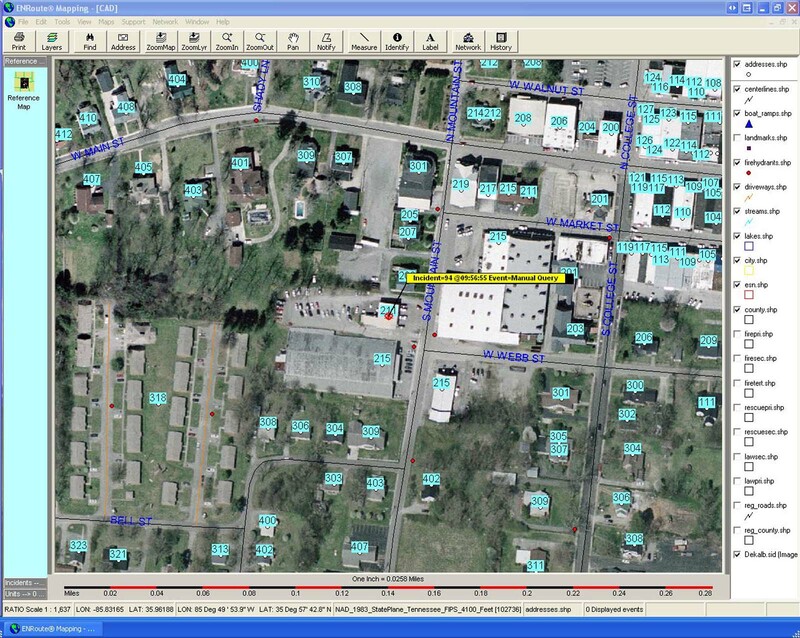 CitiTech Systems is changing to meet the needs of ESRI Roads & Highways users. We are taking our bi-directional GIS module to the next level, to allow for Roads and Highways functionality within our CMS solution! Just another example of how CitiTech is constantly improving our software. To learn more about the ESRI extension itself, click here. On another note, ESRI has stopped supporting ARCGIS Version 9. CMS will continue to work with ARCGIS Versions 9 and 10 both. 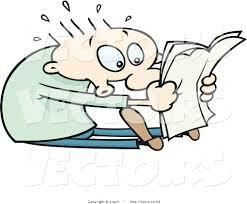 However, if your ESRI license runs year-to-year, you will not be able to “renew” version 9 when it expires. If you have a perpetual ESRI license, you won’t necessarily need to upgrade it to Version 10; but note that ESRI won’t be able to help you if you have problems with your map, and CitiTech Systems won’t be able to add or change any map functionality. 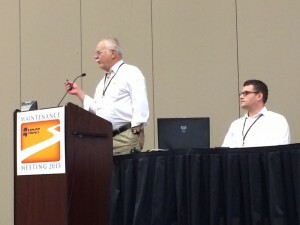 Your bi-directional GIS functionality will be effectively “frozen in time”. Guru’s Corner – Featuring Stacie and Jay! Meet our newest developers! We are lucky to have two smart, talented developers join the CitiTech team, just in time to be in on Version 9 at the beginning! Their fresh perspectives, ideas and talents during CMS’s evolution can only serve to make it even better. Jay Pearson started with CitiTech in mid-November 2014. He has an Associate of Applied Science degree in Programming and Application Design, from Western Dakota Technical Institute. He says, “My favorite part of my job is working with all the new technologies we’ll be using in Version 9.” He’s looking forward to growing, both personally and professionally as a developer. Welcome to the CitiTech team, developers! Accomplishments… your way! Now you get to decide how your Work Order’s and Work Report’s work accomplishments behave. And we listened! It inspired a new system preference – so you can have it your way. With the “flick of a switch” (system preference), you can decide how your Work Accomplishments default (0, 1, your activity’s ADP, or a negative value, which forces users to enter a valid value). Just another way your input improves our software – for all versions. The CitiTech development team has been hard at work bringing you a better experience in Version 9 – but to create something truly amazing we need you. In the near future we will be releasing our Beta version to our users for their input on the user interface for CMS, now that we are wrapping up the code behind it. What should we expect in Version 9 and the upgrade process? We are proud to introduce our new approach for displaying reports using Stored Procedures. In Version 9 you will see a new report interface, user-modifiable queries (before the query is sent to the server, to reduce the amount of data being sent over the network), the ability to view the SQL of any data set CMS produces for reports, data readers, and more! CMS has had a face lift, and is taking a new name – CitiCore. We are working hard on improving its look and your user experience. This is where your feedback will matter most so we can provide you with a tool that works for you, and is easy to use. New technology is constantly evolving and we are excited to bring you CitiTech’s first step into our new future with CitiSmart – the Dispatcher module. This is only one of the many steps you will see as Version 9 evolves over its life cycle and beyond. 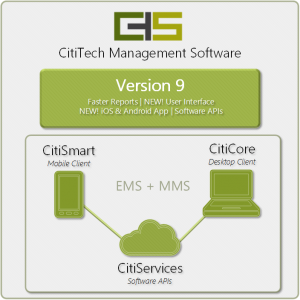 With the CitiSmart app, users will be able to dispatch work orders via email or text to users in the field. The user can edit work order information, start and stop work with NEW timesheet functionality, and complete the work order by creating a work report from said work order. The good news: the Dispatcher module is just the first of many modules in our vision to bring parts of our software to the field. The even better news: it will also be available in Version 8.5! The next update will include this functionality… look for it in the near future. The best news of all: if you currently own the Work Order module, the Dispatcher module is yours at no charge! Over the development cycle of Version 9 we will be releasing Web APIs for our various modules that will reproduce all their functionality. Initially, the Work Orders module will be available, and additional modules will be released as we develop them. This is what we have been up to, and we hope you’ll provide feedback… join us in creating something truly amazing!